Everyone likes to get free stuff, even when it's junk -- like brochures and keychains at a trade show, or a reusable bag from your local market. Retailers and businesses give out free things as a marketing ploy, to build rapport and disseminate information. Another form of free comes in the newspaper ads, with the buy one get one free coupon, or the holiday giveaways (think Black Friday.) These giveaways are designed to attract patrons to a certain retail location in hopes that they will spend more moeny, come back more often, and essentially support the business. It seems to work as my mailbox is inundated with these coupons nearly everyday. So, with my tabletop covered in coupons and freebie offers, I began to think, how can Rustbelt cities and cities with declining populations use the idea of free to attract new residents. The goals seem similar, stores need people to come in and buy their assorted goods while cities need to attract people to come and start businesses, raise families, and pay city taxes. Perhaps these cities could create marketing campaigns targeting young creative entrepreneurs by offering buildings, land, space, tax breaks. After all, the Rustbelt is, if nothing else, is rich in land and space, just look at Flint. There exists a whole class of creatives out there who would love to start their own businesses but can't due to the burden of large overhead costs especially in business hubs like NYC or Chicago. Rustbelt cities in conjunction with the internet's world wide marketplace offer very low overhead costs. However, in order to make these individuals pack their bags and move to a new city that they know little about and attempt to form some type of business, they need incentive. Businesses take time to start, and by offering entrepreneurs free rent, you are granting them time to learn the city, be inspired by the city, and establish their own business' in the city. The real power of a program like this comes in the formation of a community. Once the idea catches on and creatives begin to take to he plunge into the Rustbelt, stronger and stronger creative communities will form attracting more and more people to the city. This can be seen in the reformation of the DUMBO neighborhood in NYC from a burnt out, unattractive block, into a vibrant community of artists and professionals. 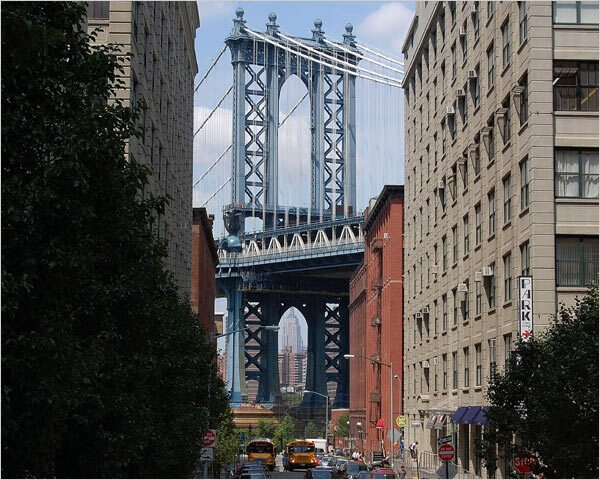 David Walentas, a NY developer bought up a huge portion of the Dumbo neighborhood in the late 90's then enticed an array of artists to take up residence by offering free rent for an extended period of time. The artists attracted the professionals and soon the neighborhood was bustling with a diverse group of New Yorkers. So the question is, can this work on a national if not global scale with the Rustbelt and other declining cities? 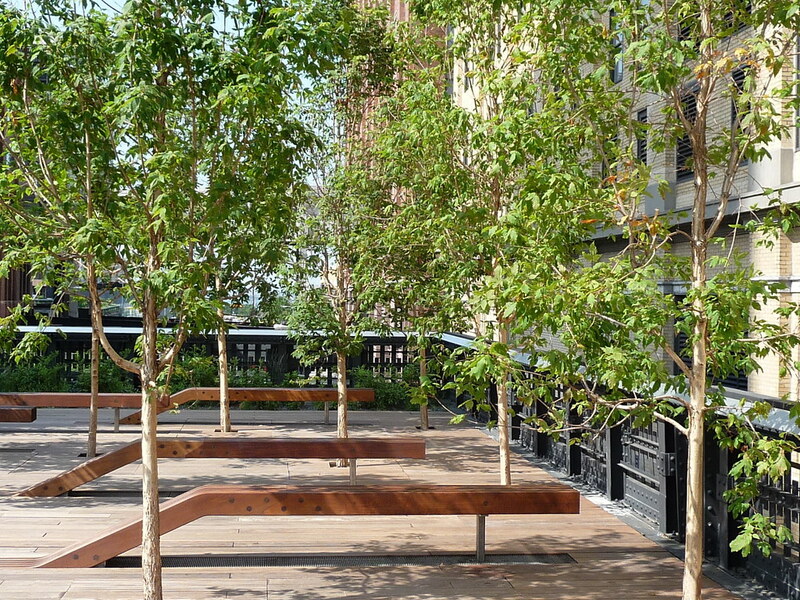 The High Line is an elevated park that runs along a portion of Manhattan's west side. It was once a railway, in use from 1934 until 1980. As vegetation took over, it became an informal and (not completely) inaccessible greenway above the streets. Neighborhood residents Joshua David and Robert Hammond started Friends of the High Line in 1999, hoping to save the structure from demolition and build support for the park idea. The city approved funding in 2004, and the lower section (from Gansevoort to 20th Street) opened in June. 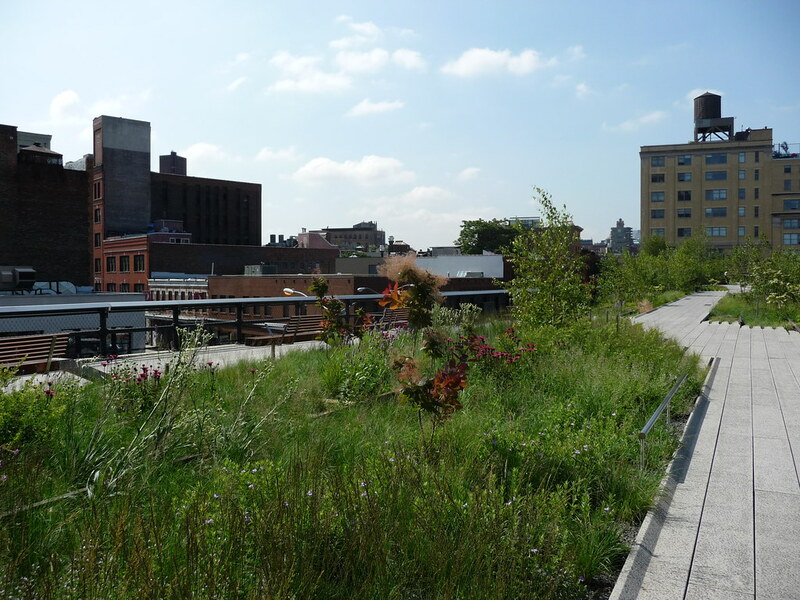 The park was designed by James Corner Field Operations, Piet Oudolf, and Diller Scofidio + Renfro. It is made up of pathways that weave through the original train tracks, as well as diverse plants inspired by those that grew in the absence of maintenance. The city plans to continue the park along the Hudson Yards to the Javits Convention Center. According to Mayor Bloomberg, the first section has sparked considerable neighborhood development, with more than 30 new plans now in the works. 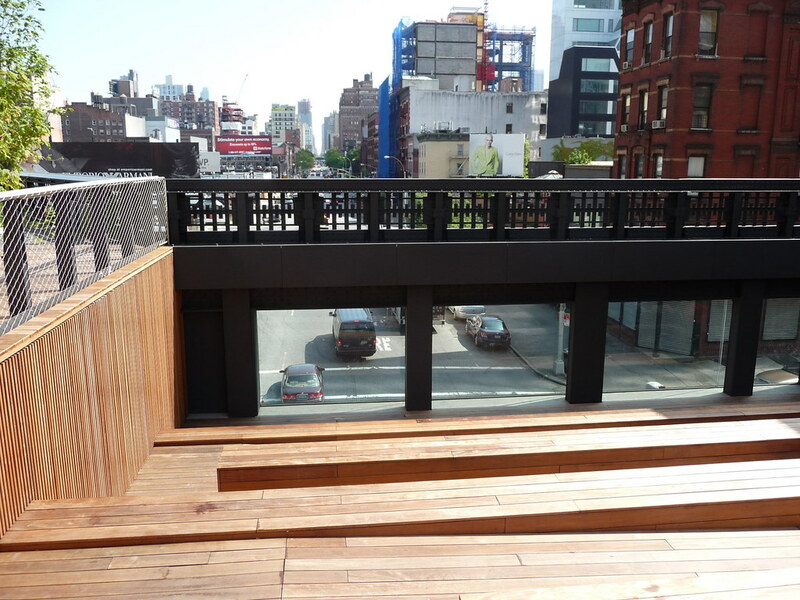 The Whitney Museum is building an extension by Renzo Piano at the Gansevoort entrance. 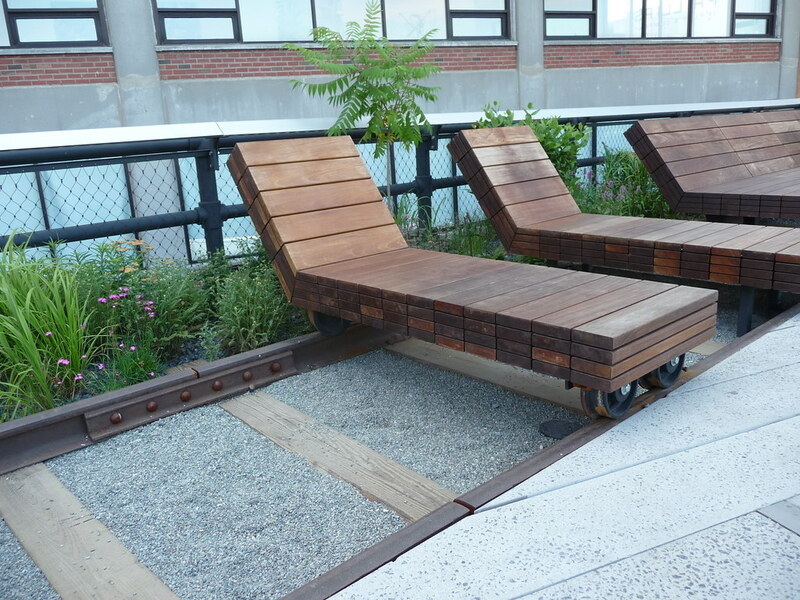 On a recent visit, I was impressed by the High Line's varied landscape and playful atmosphere. It offers a different perspective on the city, where things come into view that are usually hidden from street level. The path moves along and through buildings, creating excitement in the discovery of new environments. The architecture is kind of slick, but it also has a relaxed, inventive feel that plays well against the seasoned ruggedness of its surroundings. I really like the idea of including the original train tracks. This might be even better if their continuity could somehow be maintained. They currently seem like set pieces rather than historically integrated parts of the neighborhood. I loved the rolling chairs on tracks, and the vegetation is tough and beautiful. The spectator windows onto the street (or into the park) are an interesting concept, framing everyday life as entertainment. However, I'm not sure the frames and stepped seating add much to the view, and they seem to draw energy away from the path. These opinions, however, are especially inconsequential in light of the overall greatness of the park. 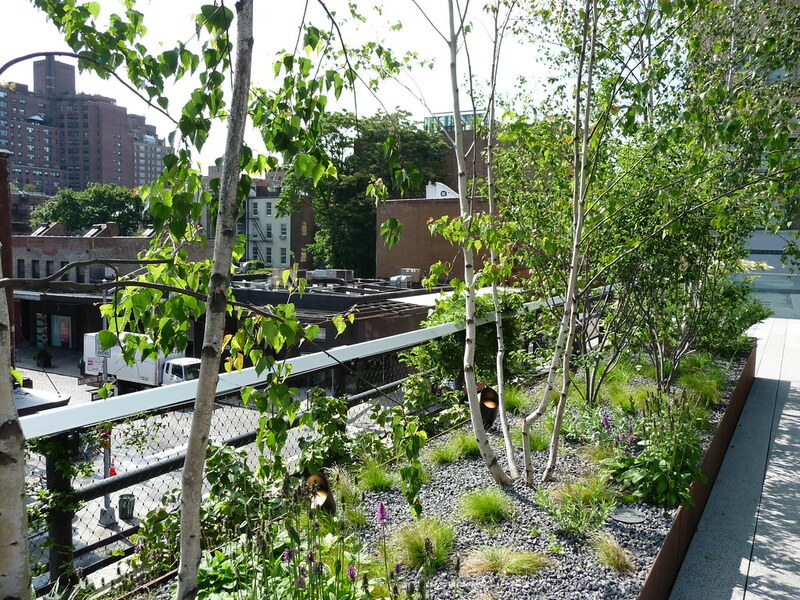 The High Line is a wonderful part of the city's changing ecology, one that builds upon the old in shaping the new. I recommend starting with the exhibition Mannahatta/Manhattan: A Natural History of New York City at the Museum of the City of New York. It includes detailed reconstructions of the island before modern development, giving a sense of how our current moment fits within the area's unfolding story. The American city has taken quite the rollercoaster ride over the past 70 years. For the half century following World War II, anti-urban sentiment managed to keep pace with the United States’ unprecedented affluence, creating glistening suburban landscapes that surrounded increasingly troubled urban cores. Eight of the ten largest US cities in 1950 recorded their historical population peaks that year (only New York and Los Angeles continued to grow after that census). This trend has reversed itself in the past couple of decades, of course, and most cities have benefited from the newly widespread appeal of urban living. As Mark Twain reminds us, though, history tends to rhyme rather than repeat itself, and the rebirth of cities is no exception. A few months ago, Marc described a phenomenon he called Earbud Urbanism. Contemporary technology as epitomized by the iPod, he wrote, now allows us to replace our actual surroundings with personalized content, one sense at a time. Kazys Varnelis made a similar point last week, just before the 30th anniversary of the Sony Walkman. The Walkman, he wrote, symbolizes the recolonization of US cities just as boomboxes (perceived as “sonic assault devices”) symbolized the height of urban tension and decay. Why, then, did cities become more appealing in the 1980s and 1990s? Perhaps Earbud Urbanism contributed by making it easy to ignore the unsavory elements of urban environments. In the 19th and early 20th centuries, cities teemed due to lack of choice: If you wanted to do certain things you needed to be in the city. Now, our choices have increased exponentially, and comparatively few people truly need to be located at any one place in order to do something. Everyone’s loved ones are just a virtual arm’s reach away, consumer products can be delivered to some of the most remote places on earth, and one can practically run a business without rolling out of bed. The physical locations of jobs seem to follow people to where they’ve decided to live, instead of the opposite. Perhaps the suburban fortess mentality of the postwar era gave way to a subtler kind of fortress mentality. The affluent who have chosen to return to the city have come back on their own terms, not the city’s. Many inhabit condos that are sealed off from the surrounding urban environment, with plenty of parking infrastructure to facilitate driving everywhere else. The same high-end chain stores, also with ample parking, have even filled in the formerly industrial spaces of many cities (Chicago’s Clybourn Corridor, for example). And when we do have to venture outside of our comfort zones on foot, of course, we have our iPods to keep us company. Cities have been getting a lot of attention lately with the majority of earth's population residing in dense urban cores for the first time in history. There seems to be a growing consensus that cities are the way forward and that suburbs should burn in hell for destroying out beautiful countrysides, our farmlands, and promoting unsustainable lifestyles. So how do we resurrect the suburb or make it better? Are we planning on disassembling them and using the material to build new urban dwellings or are they going to become abandoned and sit empty? Is there a way to think about the burbs differently that will lead to a new lifestyle or a renewed sustainable energy? To survive long-term, the suburbs will likely have to become more community oriented and organized. This century thus far has proved to be about social and sustainable movements. Two movements the suburbs can embrace to improve their chances of retaining and attracting citizens are intense car sharing programs, and intense community farm programs. Typically, neighborhoods center around some type of public space, whether that be a park, an elementary school, or another type of community-oriented structure. These centers could act as transport hubs, where car share programs are initiated. Programs like carpoolconnect.com can help people find rides and coordinate with neighbors to accomplish errands and daily tasks. Perhaps it seems extreme, but if the suburbs want to kick their negative wrap, they are going to have to show they can compete with cities on transportation and social interaction. 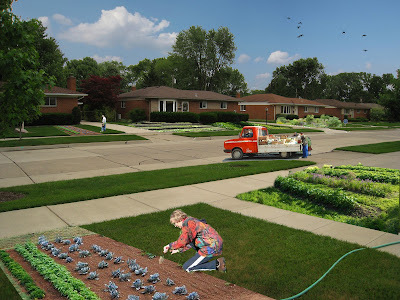 Suburban farming has become a big thing as well. Though urban farming has attracted much of the attention because of its extreme conditions, many suburbanites have been converting their yards into mini-farms and, in some cases, turning a profit. Many organizations have popped up to promote the transformation of turf lawns to lush homestead farms, most famously Fritz Haeg's Edible Estates. His organization has inspired a new breed of farm and a new brand of agriculture. Companies are beginning to form around the country with the intention to lease and cultivate neighborhood lawns. Weekly neighborhood farmers markets could be held at the community center with the majority of produce and added value products coming from within the neighborhood. When it comes down to it, the suburbs need to bolster their sense of community interaction in all areas of their citizens daily life from transportation methods to food choices to live/work arrangements. The suburbs aren't going to just disappear, so hopefully in the next few years we as a society will develop some new suburban living models worth promoting. Why is it that so many of the people out there studying/analyzing/writing about new urban trends, new technologies, new social configurations, etc. are either well past or fast approaching midlife? Watching academics (or worse: bureaucrats and business gurus) try to keep up with the frenetic pace of our present-day spatial, cultural, social, etc. milieus can be a sad sight. Pro Thinkers struggle like parents or marketeers or morning TV hosts to stay current and swank and therefore (allegedly) relevant. They are quick to embrace buzz working concepts, and just as quick to dump them. To make matters worse, even regular people like you or me have a hard time upholding concepts, just like we do keeping relationships, tastes, personal aims, political allegiances and attention spans. We consume our concepts like we consume our everydayness. The problem is that a number of these concepts could actually be useful and significant. They are unfairly — even irresponsibly – deemed tired, passé, fizzle; superficially exhausted and then dumped. One of the poor bastards in this bunch is the notion of "informality". After a brief, guilt-driven stint of Western academic and media focus on the subject, at the moment informality sounds as old and worn as French Theory. Something to roll your eyes over. I don't want to redeem anything or anyone here. I just don't think ideas should be treated as disposable objects. Ideas always linger and creep back up when you least expect it. It's only fair that we're tired of hearing the same stuff from the same people, over and over again. OK. But that doesn't mean that everything that needs to be said has been said. - Can anyone actually pin-point "informality"? Or is the notion simply elusive and any attempt at this futile? - Is the concept itself inadequate? Particularly considering there isn't an actual divide between formal and informal, that they are both the same thing: reductive categories that try to organize and make sense of functional and active by-products of our (Modern, global) development schemes and efforts. - Do we really have to keep opposing the "informal" to the Western-developed-organized-etc.-etc. or can we maybe start understanding it as a mirror modernization, as the crooked limb of Modernity or its bad twin? 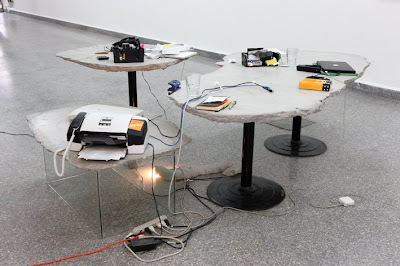 - Instead of considering it an absence of logic, can we accept informality as a logic in itself, with controls and hierarchies and orders and struggles and changes and growths? - If we want to emphasize the historical breach and inequality of modernizing processes, why not simply try to analyze and describe how unequal types of development are crashing up against each other and invading each other as a result of globalization, instead of making it an Us vs. Them thing? There is no Us vs. Them. We've all been smeared. - Beyond aesthetics, isn't informality ugly (scary even) because it reveals too much about our dirty, insecure, two-faced Modern selves? 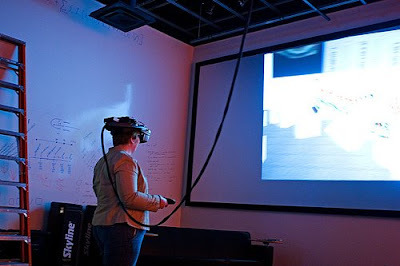 - How about picturing an enhanced version of the informal? One that isn't primitive or picturesque or exotic, or at least not in its entirety. One that is inextricably related to whatever happens elsewhere: interconnected, active (sometimes aggressive), efficient and significant in its own right. One that we need not pity or fix, but understand. Would anyone like to take a shot? (Photo by Pablo León de la Barra. José Rojas at House of Gaga in Mexico City. From the Centre for the Aesthetic Revoluction). A public school in Philadelphia is training students in food production and environmental care on an urban farm. The Walter Biddle Saul High School of Agricultural Sciences is a magnet program with 600 students from throughout the city. Located in the upper Roxborough neighborhood, it includes a 130-acre farm with livestock, greenhouses, crops, and pastures. Saul offers concentrations in Food Science, Floriculture and Greenhouse Management, Landscape Design, Animal Science, and Natural Resource Management. In addition to the agricultural program, students take a full range of high-school, advanced-placement, and college-level courses. The results are impressive. Saul's average graduation rate is 95 percent, with 80 percent going on to college. Other students start their own businesses or are hired into skilled agricultural jobs right after graduation. Amanda Forstater, a 2009 graduate, recently gave me a thorough and enthusiastic introduction to Saul. Students begin with an intensive summer program, which provides training and experience with the different areas of concentration. This helps incoming freshman select a major and understand the kind of work that will be expected of them. They usually have a particular agricultural career in mind -- from local farming to designing parks, managing athletic fields, and caring for animals. 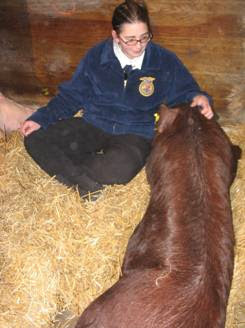 During the school year, students work on the farm each day. Freshman and sophomores spend one and a half hours, while juniors and seniors spend two and a half. The jobs increase in complexity as the students acquire more training. There is a farmer who lives on-site and manages daily operations. Students are encouraged to take on leadership responsibilities in school activities, internships, and the National FFA Organization (formerly Future Farmers of America, but renamed in 1988 to include all agricultural careers). Internships and job-training programs have been set up with the U.S. Department of Agriculture, the Schuylkill Center for Environmental Education, the Philadelphia Eagles, Somerton Tanks Farm, the U.S. Fish and Wildlife Service, J. Franklin Styer Nurseries, the University of Pennsylvania School of Veterinary Medicine, and many other local and national organizations. Saul has established a Community Supported Agriculture (CSA) partnership with Weaver's Way Cooperative. This provides the neighborhood with local produce as well as education and employment opportunities. Students are closely involved in the process. They can also work for the school farm over the summer. It is common to see them operating tractors, milking cows, and growing produce year-round. Saul students come from urban homes with little if any farming experience. 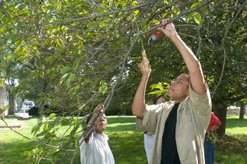 The program is helping to reestablish links with agriculture that have been lost through years of migration to cities. Along with the Chicago High School for Agricultural Sciences, Saul is among the few urban agricultural schools in the country. Visits are encouraged, and based on Amanda’s glowing account, it's very much worth the trip.